The Easter break has given me a chance to work on my ground a little bit. These pictures aren't the best, and it's a long way from being complete but hopefully you'll get the idea... and I'll post as often as I can with updates if you're interested. 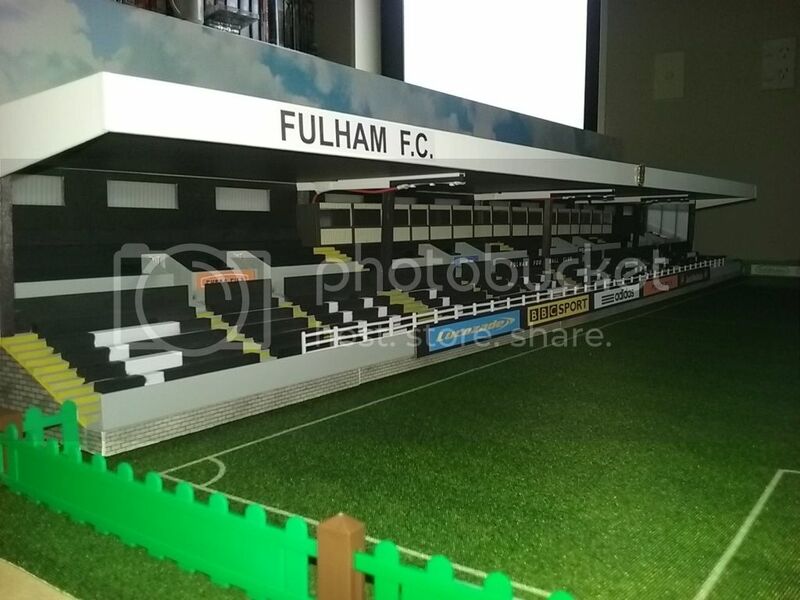 The famous Craven Cottage has been the home ground of Fulham Football Club since 1896 and in real life it is charmingly located next to Bishop's Park on the banks of the River Thames in West London. This location provides some (i.e. too many for me) modelling challenges, so licence has been taken with relocating the position of this ground. The initial construction was not without its difficulties and work on the ground was met with delays and even completely stopped several times for lengthy periods due the complaints of near-by residents (i.e. the kids) and the objections of the local authorities (i.e. the wife) when the spare bedroom come children’s play room was need to accommodate an unforeseen (yet rather lengthy) visit from the mother-in-law. After a more permanent site was negotiated, the ground was re-located to the garage. 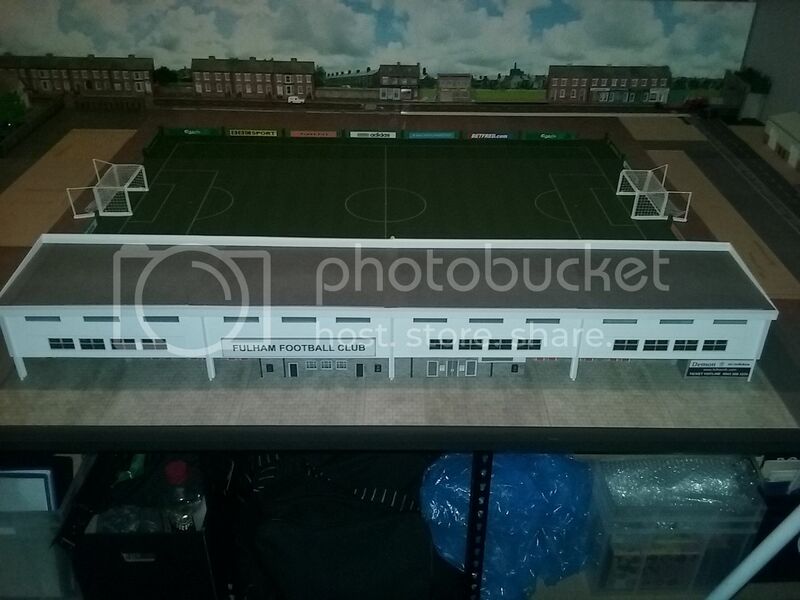 Construction then resumed in earnest on the increasing inaccurately named Riverside Stand and the surrounding local community of terraced houses and a block of shops (which may possibly yet incorporate the club shop). The previous playing surface had received much criticism from some quarters. To retain the cosiness and traditional charm of the club, the current surface is a slightly smaller than standard custom made pitch (with very similar playing dimensions to the real patch of Cottage grass - 110 centimetres by 75 centimetres verses 110 yards by 75 yards (ref. The Official Football League Yearbook 1998/1999). The goals themselves are also due for a renovation, and the fence surround will also be replaced. 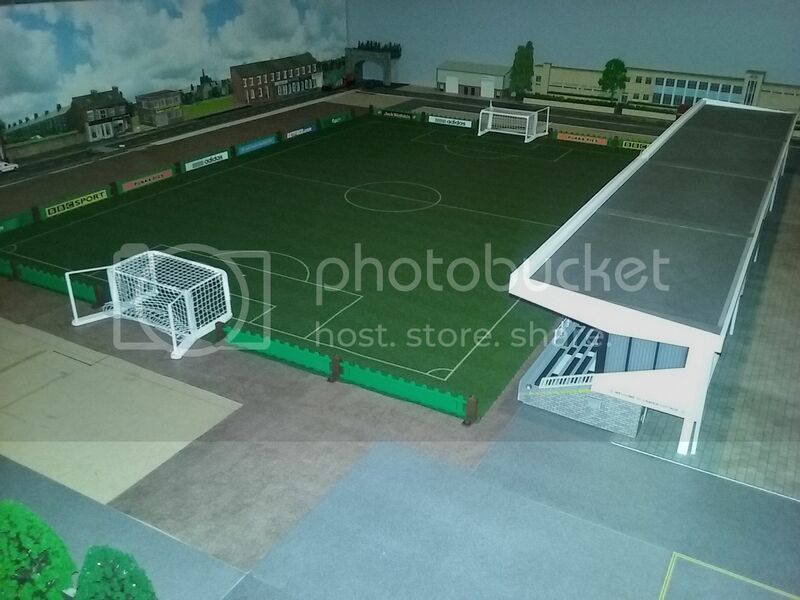 As previously mentioned, the difficulty and feasibility of modelling the River Thames has forced the current club owner to take some licence with the location of the stadium. While the areas surrounding the ground are being developed the Volcano Road (so named by Conor – aged 6) side of the ground was the first to be upgraded. 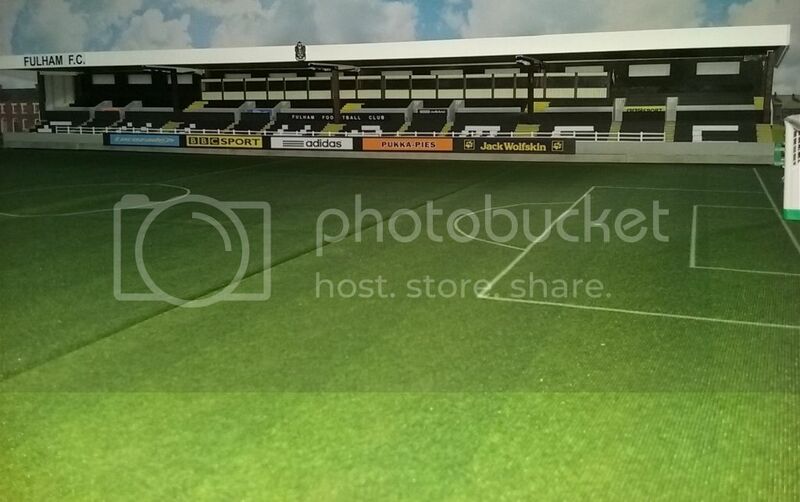 The stand has a removable roof and is uniquely elevated above the pitch unlike the proposed Johnny Haynes Stand and the two open terraces which will grace either end of the ground. It contains LED lighting in the roof and a suite of corporate hospitality boxes. 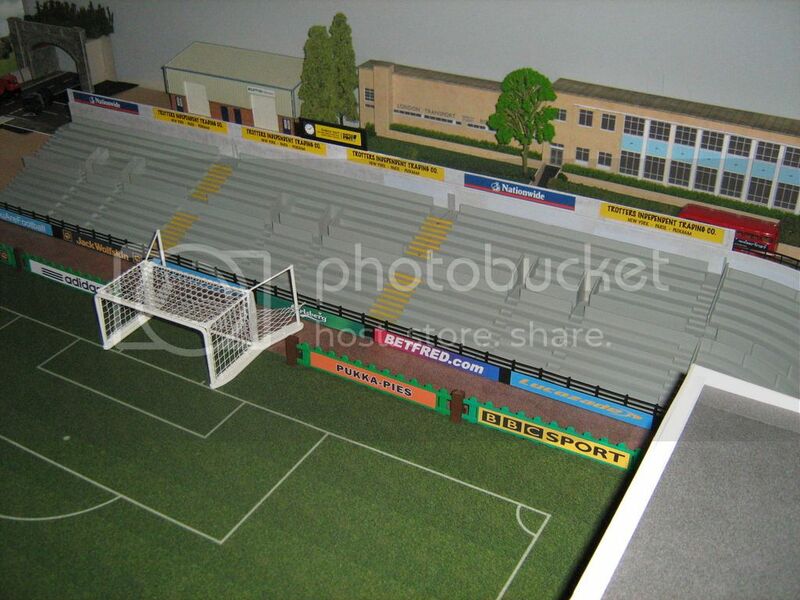 A TV gantry are also being planned for inclusion in the stand, as well as the addition of a few more minor details. On this side of the stadium some turnstiles, a VIP gate, and working floodlight pylons are also under construction. The rest of the ground is yet to be built but the Putney (or Washing Machine) End will be to the left as we look, the Hammersmith End will be to its right, and the Johnny Haynes Stand will be on the opposite side of the ground. Excellent work and look forward to seeing it progress. 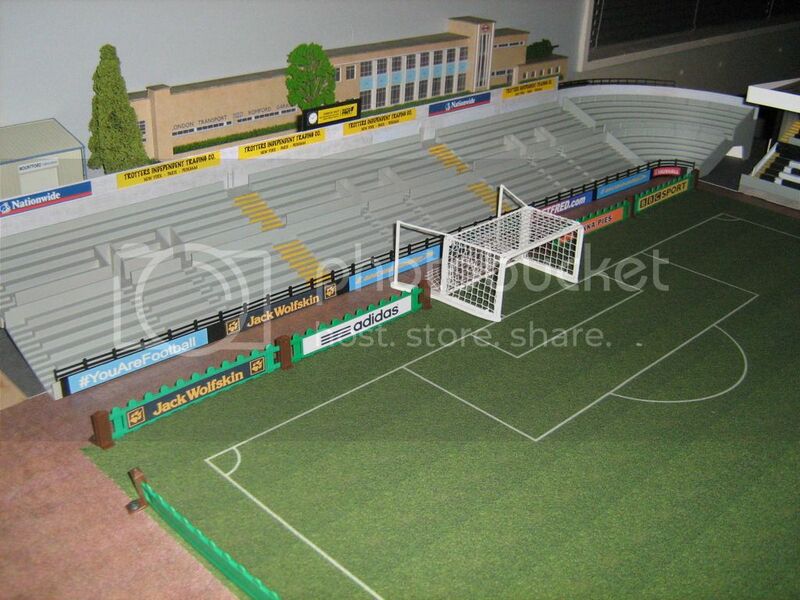 I think the addition of a diorama around a stadium brings it to life. When I added one to parts of my Goldstone ground it lifted the whole thing. That really is very good! Craven Cottage is one of my favourite grounds and maintains a character all of its own. Look forward to seeing how it progresses. Sorry for the delay in updates, but I will get some pics posted in a day or so. As you can see the "Riverside Stand" has been relocated to the opposite side of the ground - a more natural location for it - and the cinder track around the outside of the pitch has been laid. The new goals are in place and the upgrade to the hoardings completed. Work still continues on the surrounds to the ground as the Putney Terrace is nearing completion and a couple of days away from being placed next to Riverside Stand. 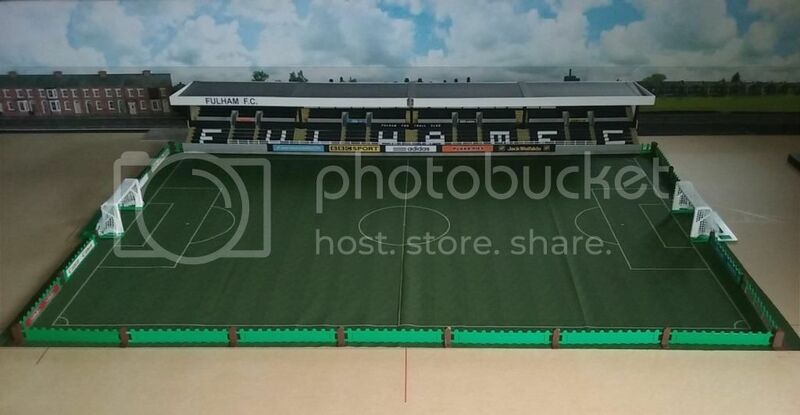 The Putney Terrace placed behind the goal is still awaiting a few more minor finishing details and the floodlights. Absolutely stunning love it... Probably my favourite stadium in the UK. I agree Flash, looks good. Trotters, billboard haha, class. 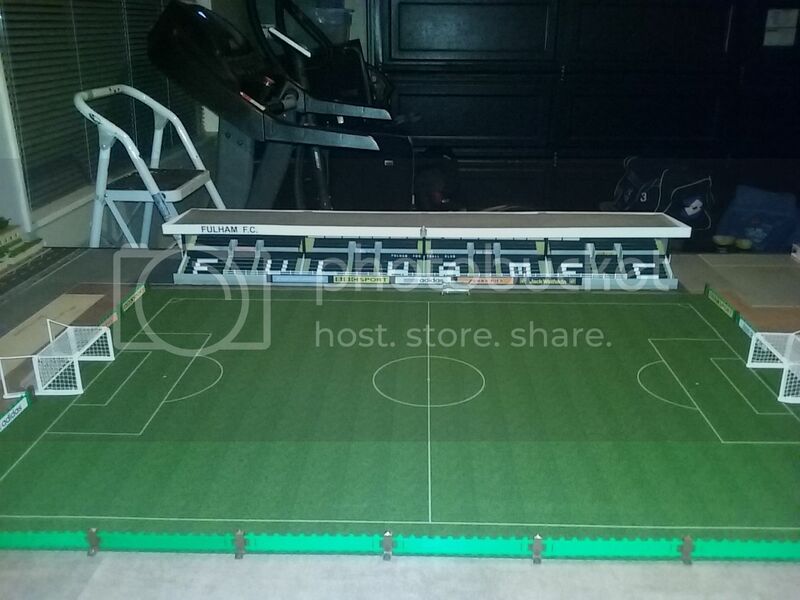 Loving that stadium, whats your pitch type. A real authentic grass look! would the traditional goalkeepers work in your goals? Curious as I have the plastic goals and traditional rodded keepers with the 2012 edition.